Great healthy way to start off the new year! Roast the cumin and coriander seeds in a cast iron skillet on a medium high heat for 3 to 4 minutes or till the seeds become aromatic. Take off the heat and grind smooth in a coffee grinder. Take out in a small bowl and add the turmeric and cayenne pepper. Keep aside. Heat a heavy saucepan with the olive oil. Add the onions and garlic and sauté on medium heat for 3 to 4 minutes. Add the tomato paste, harissa and the spice mix. Saute for 2 to 3 minutes. Add the potatoes, turnips, carrots, chickpeas, chicken stock and salt. Bring to a boil and lower the heat to a simmer. Cover with lid and cook for 30 minutes. Take the lid off and check to see if the root vegetables are tender. Mash some potatoes with the back of a wooden spoon to slightly thicken the liquid. Add the olives and apricots. Turn the heat up to cook off some of the excess liquid to get the desired consistency- it should be like a thick soup. Add the almonds, cilantro, parsley and dried mint. Check for seasonings and serve with couscous. Mix the cinnamon, ground cumin, ground ginger and salt in a small bowl. Sprinkle the chicken breasts with the spice mixture and let stand for 2 hours. Heat a wide saucepan with olive oil and brown the chicken breasts on high heat for 2 to 3 minutes on each side. Take out of the pan and keep aside. Reheat the pan and add the onion and garlic. Saute on medium heat for 3 to 4 minutes, stirring every 30 seconds. Add the tomatoes and continue to cook for another 2 to 3 minutes. Add apricots, chickpeas, honey and chicken stock. Bring to a boil and lower heat to a simmer and cover with lid and cook for 45 minutes, checking every 15 minutes. In the meantime, slice the browned, uncooked chicken into slices. Take the lid off and add the chicken. Cook on medium heat for 3 to 5 minutes till the chicken is cooked through. Check for seasonings and add salt as needed. Garnish with cilantro and parsley. 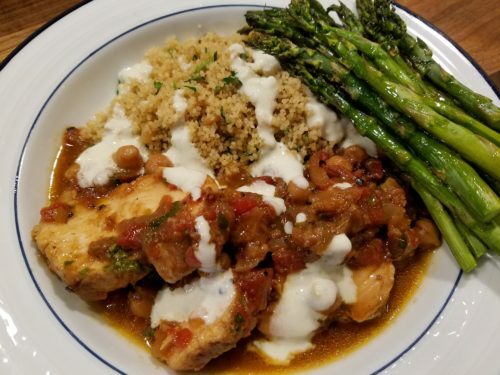 Serve with couscous and yogurt sauce. Heat a medium saucepan with the oil. Add the ground cinnamon, cumin, pine nuts and salt. Saute on medium heat for 30 seconds. Add the chicken stock and cover with lid and bring to a boil. Add the couscous, turn heat off and cover with lid. Cook for 5 minutes. Fluff with fork, check seasonings and garnish with parsley and cilantro. 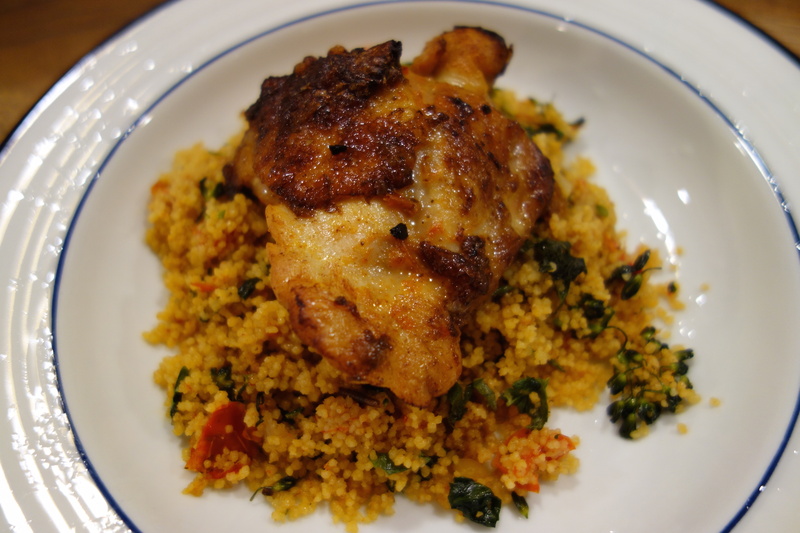 Mix all the ingredients and serve with the chicken and couscous. Mix all the marinade ingredients in a small bowl, mix well and marinate the chicken with most of the marinade- save 2 tablespoons for the potatoes. Marinate the chicken for at least 2 to 3 hours. Place the chicken pieces into an oven proof tray. Sprinkle some extra salt under the skin of the chicken pieces. Poke the skin with a fork. Add the potatoes and mix the remaining marinade, mix well and roast in oven on a 325 degrees F for 40 minutes. Brown the chicken and potatoes under the broiler at the very end… it makes the skin super crispy. Take the chicken out of the pan and let it sit for 10 minutes. 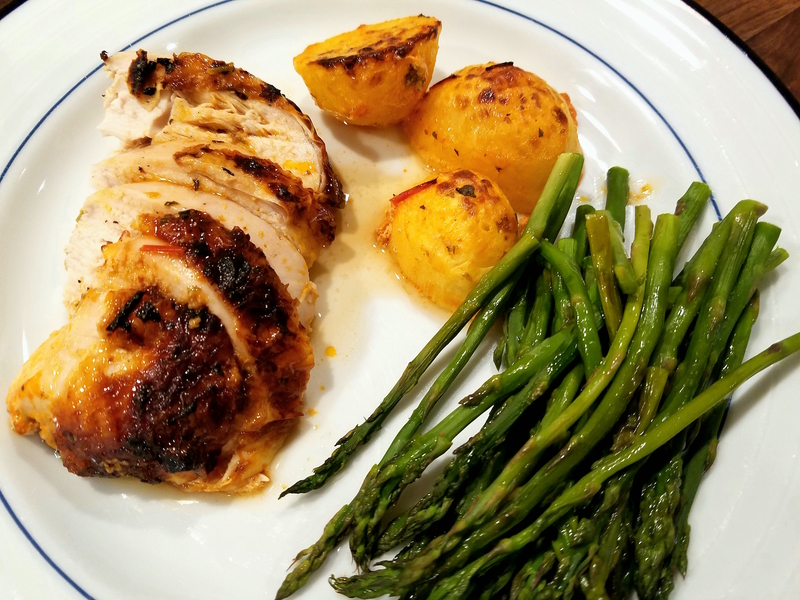 Slice and serve with the potatoes and the roasted asparagus. Transfer the asparagus to a cookie sheet. Add the oil and salt. Mix well and roast in a 400 degree F oven for 20 minutes. Mix the harissa, oil, preserved lemon and salt in a small bowl and marinate the chicken with the mixture for 2 to 3 hours. Heat a large frying pan with the butter and olive oil. Brown the chicken pieces on high heat with skin side down- approximately 3 to 4 minutes on each side. Take the chicken out and add the chopped vegetables and 1 teaspoon salt. Mix well and turn the heat off. Place the chicken pieces on top of the vegetables and roast in oven for 30 to 35 minutes or till chicken is cooked through. Take the chicken pieces out onto a platter and cover to keep warm. Take the vegetables out and chop roughly and keep aside. Take all the liquid out of the frying pan and separate the fat and keep aside. Use the remaining liquid for the chicken before serving- it’s full of yummy flavor! Reheat the same frying pan with the fat and olive oil. Add the chopped vegetables and the harissa. Saute on medium heat for 2 to 3 minutes. Add the broth and a teaspoon of salt. Bring to a boil and add the couscous. Cover with lid and turn heat off and let the pan sit for 10 minutes. Take lid off and fluff couscous with fork. Garnish with cilantro and mint. Serve warm with chicken on top and a drizzle of the chicken liquid! This is a perfect accompaniment for the kebabs from yesterday’s post. 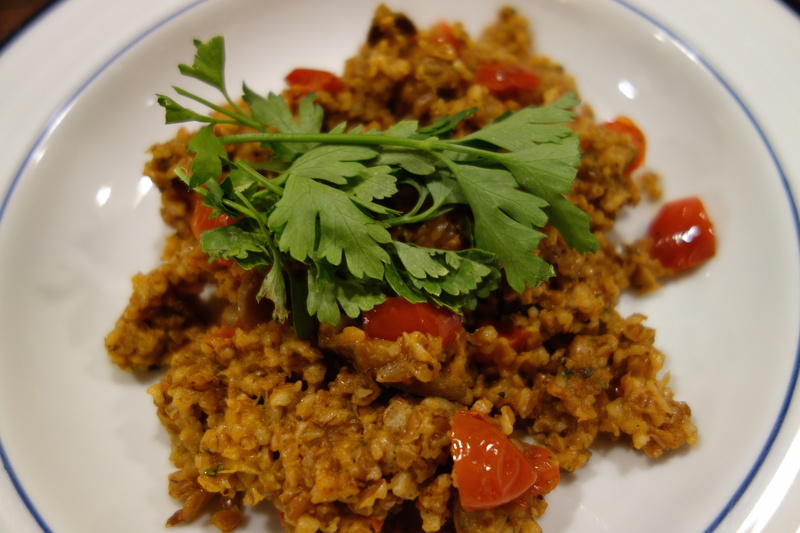 I added delicious red pepper and eggplant to the grain and included harissa which is a Moroccan spicy condiment. It was a delicious dish! Heat a large saucepan with the olive oil. Add the onion and sauté for 2 to 3 minutes on medium heat. Add the harissa and tomato paste. Saute for another 2 to 3 minutes. Add the red pepper, eggplant and jalapeno. Saute for 3 to 4 minutes. Add the tomatoes, mix well and simmer on a medium low heat, covered for about 5 minutes. Take the lid off and add the bulgur and sauté for 3 to 4 minutes. Add the hot water, bring to a boil and simmer, covered for 15 minutes. Turn the heat off and let the bulgur rest for 20 minutes. Take the lid off, fluff with a fork. Add salt and dried mint. Check for seasonings. Serve warm. 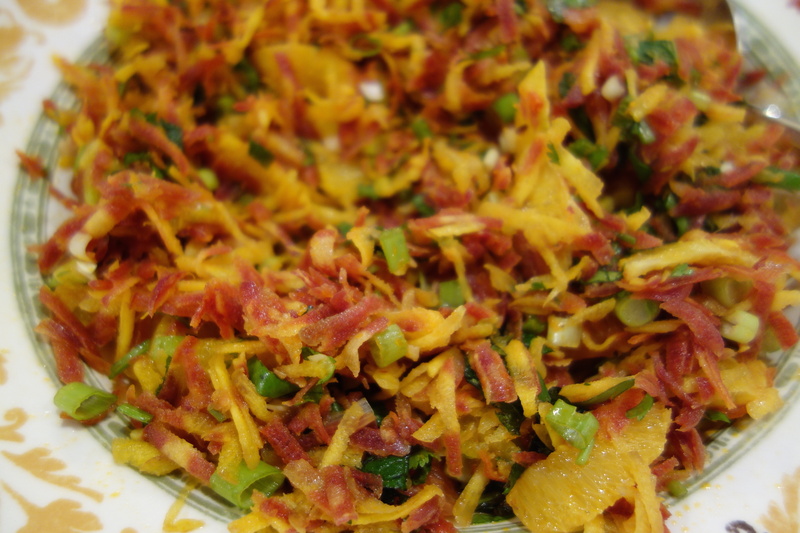 This is a great carrot salad to complement yesterdays’ stew or any other entree.. in fact, it will delicious with any grilled meats/seafood! I have buying the most gorgeous looking multi colored organic carrots from Trader Joes but any kind of carrots will do, in face you can buy the pack of already shredded carrots to keep things simple. Either way, this is a yummy salad! Transfer all the ingredients to a serving bowl. Keep aside. Transfer all the ingredients to an airtight container. Mix well with the lid on. Taste for seasonings. Pour half of the dressing onto the salad, mix well and add some salt to adjust seasonings. Pour more dressing if needed. Let the salad sit for at least an hour in the fridge before serving. Heat a large saucepan with the olive oil. Add the onion and cook on medium heat for 3 to 4 minutes. Add the cinnamon, coriander, cumin and cayenne pepper. Saute for 2 minutes on medium heat. Add the garlic and dates and sauté for another 2 minutes. Add the harissa paste, tomato paste and flour. Saute for another 2 minutes. Add the carrots and pepper. Saute on medium heat for 3 to 4 minutes. 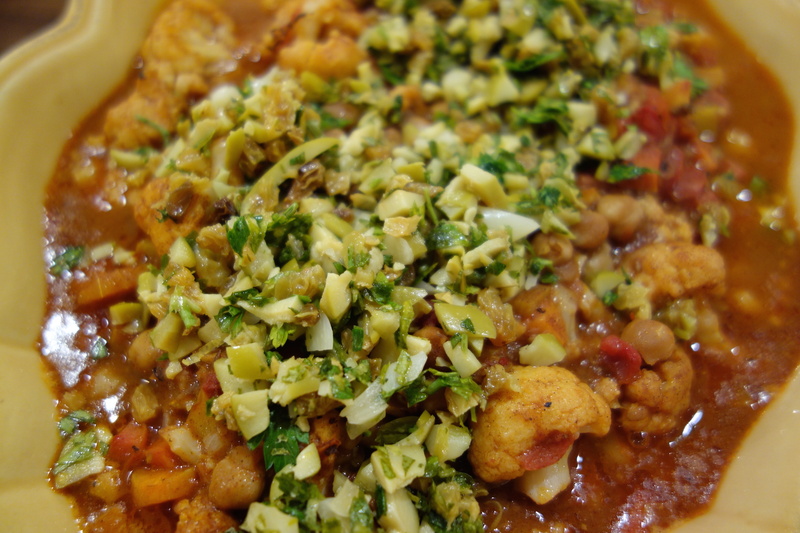 Add the tomatoes, cauliflower and chickpeas. Saute for 3 to 4 minutes and add the water or broth. Bring to a boil and add 2 teaspoons salt. Lower the heat and cover with lid and cook for 20 minutes. Take the lid off and continue cooking till the consistency is of a thick stew. Check for seasonings and keep aside. Mix the olives, parsley, raisins and lemon zest in a small bowl. Top the stew and serve.